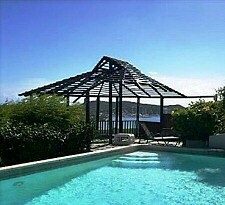 Antigua rentals: Country Inn Cottages, Falmouth Harbour Antigua. With spectacular views of the magnificent Falmouth Harbour, Country Inn cottages offer the convenience of modern living (Wireless Internet) in the relaxed setting of a Caribbean garden with a wonderful pool. 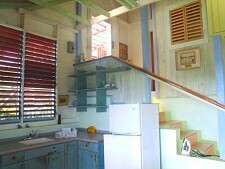 CASSI COTTAGE – with queen bed, small kitchen, bathroom with open roof shower and sea view terrace. 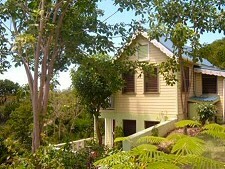 WILD TAMARIND – A two story cottage upstairs queen bed and bathroom with small balcony, downstairs kitchen / living area. (seating area can be converted into two beds). DUL DUL COTTAGE – spacious split level – upstairs bedroom with King size bed and bathroom – downstairs living area with kitchen and terrace. The cottages are located in the south east of Antigua, 25 minutes drive from the airport and a short 5 minute drive from English Harbour with numerous restaurants, bars, tennis, squash, shops and beautiful white sand Pigeon Beach and Galleon Beach. To see Country Inn Cottages on a map, please click here. Contact us today for cottage availability.